Anyone in a grinding room will tell you that using grinding coolants like CimTech 95, CX461A, or Kool Mist is a the best way to extend the life of your grinding wheel while still getting a high performing finish on your profiled high speed steel , carbide, or carbide tipped knives. Whether you are using a Cantek JF 330, Weinig Rondamat, Wadkin Visage, Kentwood G330X, Autool NX, or any number of profile grinders; using coolant products like CimTech 95, CX461A, or Kool Mist is a must to get the maximum performance out of your Cantek, Weinig, Wadkin, Kentwood, Autool, etc. profile grinders and high speed steel, carbide, or carbide tipped knives. CimTech 95....... CimTech 95 is a synthetic metal working fluid recommended for light duty grinding operations of ferrous metals. This grinding coolant is pink in color and comes in a 5 gallon pink pai, and is also available in a 55 gallon drum. CX461A.............CX461A is designed for carbide grinding applications, and will maintain low dissolved cobalt levels if maintained properly. This grinding coolant is designed for Cemented Carbide; but can also be used on ferrous metals. This grinding coolant is pink in color and comes in a 5 gallon pink pail. Kool Mist..........Kool Mist is a synthetic metal working fluid recommended for light duty grinding. This grinding coolant is blue in color and comes in 1 gallon jugs, case of 4ea 1 gallon jugs, and is also available in a 55 gallon drum. If you are using just water as coolant on your Cantek, Weinig, Wadkin, Kentwood, Autool, or any other profile grinder...STOP NOW! Contact Centric Inc and we will help you determine what grinding coolant you should be using with your Cantek, Weinig Rondamat, Wadkin, Kentwood, or any other profile grinder you may be using. We will supply you with CimTech 95, CX461A, or Kool Mist to best match the material you are grinding. CimTech 95......CimTech 95 grinding coolant can be used on cast iron, nodular iron, and high speed steel. It should NOT be used on magnesium alloys, non-ferrous materials or carbide.CimTech 95 must be mixed with water for use. Fluid may be more difficult to mix when water temperature is below 55°F (13°C). For grinding use a 1:20 to 1:10 ratio. Kool Mist...........Kool Mist grinding coolant is used for high speed steel, and displays high efficiency in the cutting of exotic metals and alloys such as Monel, Inconel, Titanium, etc., as well as all non-ferrous metals. This should NOT be used on carbide or carbide tipped material. Kool Mist unique formula of coolant is safe for people, working materials and the tools used to shape them. Because Kool Mist comes in concentrated form, it may be diluted with water in solutions up to 32:1. One gallon therefore makes 33 gallons of mix, or enough for 33 eight hour shifts at typical usage. 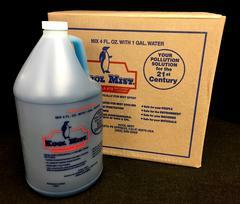 Kool Mist coolant formula is biodegradable and hypoallergenic, greatly reducing storage and disposal concerns.